Okay, so disclaimer here: the data isn’t really ‘big’ by any means and come to mention it, only some of the sharks are ‘big’ as well. But hey, a title like ‘Small and Messy Data for Sharks of Various Sizes’ is a little less catchy, isn’t it! Why would anyone want to look into this dataset? 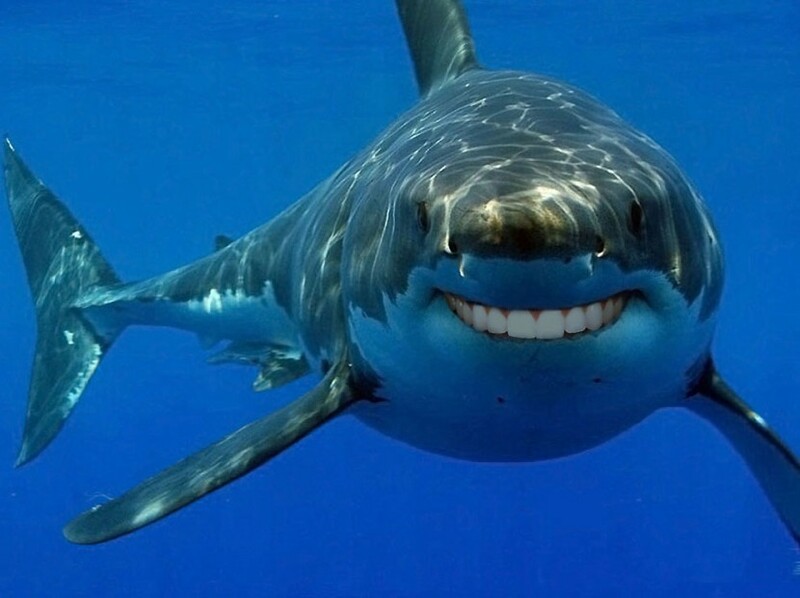 Well, sharks might be a bit scary, but they’re also pretty important and from a data science perspective, this dataset is a unique challenge given that it isn’t standardised well and contains a combination of numerical and text data. So this article aims to do two main things. Firstly, it’ll look at some nifty “deep learning for machine learning” techniques in Python, especially looking at the tradeoff between maximum data cleaning compared to using newer methods of text processing and embeddings to avoid having to feature engineer, even on structured data. And secondly, it’ll hopefully uncover some interesting sharky insights buried in this curious hodge-podge of data. The Jupyter Notebook and associated helper functions can be found on Github, here. The processed dataset (with both the original columns and additional ‘corrected’ columns — with cleaned and aggregated entries) can be found on Kaggle, here. The most likely activity related to any sharky encounter was surfing, BUT the activity most related to a fatal one was swimming. The type of shark you encounter depends a lot on where you are. In Hawaii, it’s most likely to be a tiger shark, but in Florida (aside from the ones we don’t know) it’s more like to be a bull shark, blacktip or spinner. 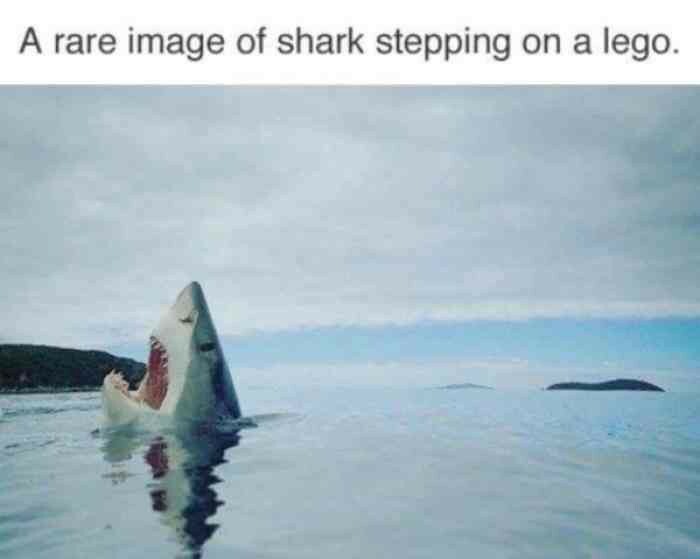 And yes, living up to its sharky reputation, in Australia, it’s the great white. Using some coarse data filter for some imputation (i.e. finding the non-surfing activities conducted solely in rivers), it looks like 127 incidents could almost certainly be attributed to bull sharks — which would put them in the second deadliest spot ahead of tiger sharks! While it seems tempting to try and ‘predict’ when and where there might be more encounters, this dataset doesn’t really contain all the information that you’d need for that task. It likely relies on the number of people in the water, what human activities were occurring around that time, prey migration, the weather, shark migrations, and sightings (Update: Found one that might work, here). Since I didn’t have those readily on hand, I aimed to investigate two problems — firstly, is it possible to predict whether an encounter was fatal based on the data available? And secondly, given the information available, is it possible to infer what kind of shark was responsible, which could be useful for data imputation. So this section will largely cover the progression of feature selection and model tweaks to improve accuracy. One thing I wanted to investigate was the comparison between new semantic embeddings methods for feature extraction from text compared to the standard machine learning techniques involving feature engineering such as aggregation of text into categorical or one-hot encoded variables. Enter Deep Learning for Machine Learning! The full HTML example is available here — recommend downloading and opening in browser for the full, interactive experience! As you can see, this method works so well at properly clustering the encounters by geographical location, activity and species because it is w̶i̶t̶c̶h̶c̶r̶a̶f̶t̶ a pre-trained character level bi-directional LSTM — meaning it doesn’t care about your garbage spelling or missing characters to do a fine job of calculating context-aware sentence embeddings. Hoorah! Cool, but how do these new ‘features’ for location, activity and species, hold up against the aggregated and heavily processed features. Short answer — effectively the same and in some cases, even better! The main benefit comes not just from improving model accuracy by capturing more relevant data but mostly from achieving the same goals without all the effort and time required to clean the dataset. Here’s a side by side comparison of the different ML methods and features. 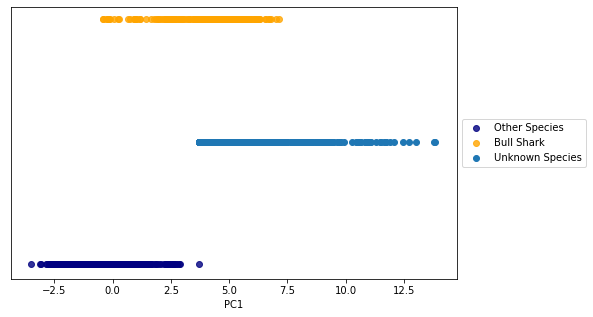 The number of features for each experiment were 110 (for the DL4ML), 217 (One-hot Encoded Features) and 8 (Categorical Features). Picking the right number of classes for the data — in this case, rejecting any encounters that were ‘invalid’ (i.e. not involving a shark) or ‘unknown’ (i.e. fatality wasn’t reported or otherwise). The intuition is that if you couldn’t effectively reason as to how to distinguish between the classes, then don’t expect the model to either. Ditto for the features — in this case, ditch the rows where too many columns are ‘unknown’. Keeping them in is like asking someone to guess what you’re thinking when you haven’t told them anything at all. 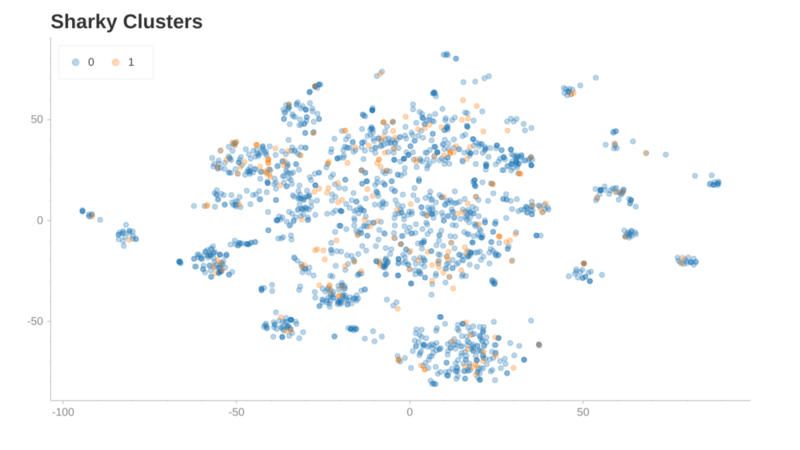 Lastly, sub-sampled the dataset to have an even distribution from the class labels. Helps prevent overfitting and false accuracy scores (created by the model just guessing the overrepresented class). Given the location of an encounter and the activity, can you guess what kind of shark it was? Or in the data imputation mindset, given that most encounters with, e.g. bull sharks, have a certain signature (like in rivers, not surfing, shallow-ish murky water) can we find other data points with an unknown shark species that probably belong to the same class? There were two comparisons for doing this. By literally string matching on the data frame to find Locations containing ‘river’ but not ‘beach’ and Activity != ‘surfing’, there are about 127 additional likely bull sharky culprits. But could there be more? Visualising the semantic embeddings of location data alone with the shark species represented by the colour, there really isn’t a very clear cluster of ‘bull shark locations’ (which makes sense, because they’re in a lot of countries). However, this is actually more of a semi-supervised problem. We know which data is bull sharky and which isn’t, so using something like Linear Discriminant Analysis is more useful for reducing the semantic embedding feature set to the components that most distinguish between bull sharks and other sharks. And this is what we get! Cool! There is at least some distinction between the location text related to bull shark incidents compared to other sharks, which can be seen where the yellow bull shark dots don’t overlap the dark blue other shark dots. Including the Activity data only marginally improves things (separates out about 20 additional points). Comparing the actual data frame entries from both the coarse string-matchy search and the LDA exercise shows that there is an overlap of about 50%, so not a perfect match, but we get other extremely likely incidents too — like ones in harbors or estuary-like places known for bull sharks as well as actual places with prior bull shark encounters, like Ballina. Data points with unknown species but predicted to be attributed to bull sharks. Previous Post:Build an Image classifier using 50 lines of code !! !